IBeAFilmDude's Blog | I want to make make awesome films, come & join in! Arguably one of the most important aspects to creating a believable ‘world’ in a film is its production design, especially that which is seen by the camera. Set design, makeup, costumes and props, each as important to the other so that we, the audience, are really in Victorian England, or exploring other world’s on the intergalactic spaceship Prometheus. So how can you ensure that when the viewer watches your film that they believe what they see is really happening? Well the first answer to that question is in the people around you, those that help with the concept, design and construction of the film’s world. I am currently seeking a Production Designer to help me do just this. Over the next few months I’ll be making a short film set six months after a zombie apocalypse. The world needs to be abandoned. Belongings, cars, offices, homes. Everyone has taken what they can, and left. Imagine picking up a town, shaking up it free of its inhabitants, then putting it back down. Then you’re getting into the world I’m trying to create. I won’t have a big budget, which means major constraint into what we can utilise and create. But as always with filmmaking, if you want to create a believable world with little budget, you need to think creatively. Before I get stuck into the design of my own ‘world’ for the short film though, I thought I’d take a look at a low-budget film set in a similar environment to see how the filmmaker and team had pulled off this feat. A 2001 film by Danny Boyle, 28 Days Later is the story of a survivor who wakes up 28 days after an aggressive virus infects most of the UK. It was made for $8,000,000 which for a feature film is not a great deal of money. Every dollar would have been pushed as far as it could, and considering the lower budget, you honestly don’t notice it. It is a fantastic film. Now I will certainly have far less money to create my short film, but what about the tricks and techniques that Danny Boyle has used to achieve an empty London? Surely there was something in the frame that I could apply to my own short? Lets take a look! So where was 28 Days Later filmed? Well a huge portion of it was filmed in the streets of London. A city of millions of people and Danny Boyle & team made it look completely abandoned. So how do you get rid of the heavy mix of pedestrians and traffic that would otherwise be there? One of the tricks they used was to film very early in the morning, during the week. It reduced the number of people in the vicinity so that they could run their takes. Adding in that they also blocked off locations between takes, allowing traffic so pass through during certain times, and you suddenly have an empty street. Sparse, yet details set dressing provides those elements that just makes the city seem forbidding and dangerous. A large portion of the external shots are from higher angles. This simply limits the field of view so that rather than shooting wider establishing shots, you reduce the amount of environment on screen. Less to control, easier to manage. Many would think its easy to implement Visual Effects (VFX) to help either ‘paint out’ or remove any unwanted onlookers, but that’s a tough thing to make look realistic enough to not draw attention to itself. Whether or not VFX was used to remove anyone in the film I actually don’t know the answer to, but certainly in the wider shots of London I can imagine there may have been an aircraft or two to get rid of. For my short film The Cure, I will be filming in/around Brisbane. Hardly as busy as London, and no-where near as tough enough to achieve the same look as 28 Days later since we’ll be operating a small cast & crew, there are still the challenges of creating an abandoned city. I want it to feel strange, an area that we know should be filled and packed with people & cars, but which is deserted. With very little budget, we won’t be able to shut down streets, and so we’ll need to pick and choose our timings carefully. Early mornings could be best for our external shots, coupled together with tighter framing and compressed shots, and we may just get away with it! If you want to follow the journey of The Cure, make sure to subscribe to the blog and if you enjoyed this analysis of 28 Days Later, please consider sharing with someone else who would enjoy. And finally, what did you think of 28 Days Later? Have you shot a film in an ‘abandoned city and if so, what tricks did you use? I’d love to hear your comments below! Hello Film Dudes & Dudettes! It’s taken a while to narrow down my focus and work out what it actually is that I want from this filmmaking malarkey. Since my last post (years ago it looks like), I’ve gone from struggling filmmaker, determined to find an outlet through film around my soul-crushing day job (I worked in insurance), to working videographer using my storytelling and technical abilities as my day job (which is an incredible feeling in itself), but at the cost of me completing very little creative work ‘for me’. 2. Meet other creatives. There are far more talented people than me out there, and I want to work with them to help bring my stories to life; like never before. 3. Get my films seen! That point seems obvious, but I don’t want to make films for myself. I want to make films to entertain people. That’s hard to do if you make a short film for a film festival, wait 6 months before its seen and then put it online as an afterthought. I want people to enjoy my films, as much, and as regularly as possible. So my focus has been to create a YouTube channel, a place to achieve all of those points above. It will be a place for me to showcase mine and others hard work, but also a place where people can come to learn about the process of filmmaking. not so much the technical or how to, but an idea on the processes involved in communicating with cast & crew to create something more than just ‘words on screen’. So watch this space for a more updated website, follow along with me, and if you like what it is I have to say, I would be eternally grateful if you shared this post. Two awesome actors please. No payment. Must sacrifice own life. Apply within. 1. To get people interested enough to be involved in whatever part of the filmmaking process that you need help with, you need to be able to back up your claims of ‘if you work with me, you will be creating a great film’. I was as transparent as possible on ‘Journey From Madness’, and presented the full script to anyone who would be interested in reading it. Local based professionals, online talent, whoever I sent it to, I went back to the story and made sure it was as good as I could get it. So..give your script one last read through. 2. Reaching people who have some creative talent and can help contribute to your project is difficult. There are however, a number of online forums that I have personally had success with. Online casting directories such as Star Now offer a great platform to post casting calls for not just acting talent, but valuable crew as well. Here is a link to my most recent casting call, with over 60 applications. In it you can see that again, I have tried to be as transparent as possible and give as much information as possible. Other venues such as vimeo give you the opportunity to browse and post videos created by the users, and you can hunt down and communicate will sorts of creative types. 3. Whilst you may not be able to arrange payment, make sure that on your shoots/during post production that your cast/crew are as comfortable as possible and get lots of food/snacks/beverages together to keep everyone going. It really keeps the morale up, and gets to have a quick chat around the eskie or coffee dispenser. 4. Have fun. This should actually be number one I think. Oh well, too late. By making it an enjoyable day for all involved, you are more likely to get better performances out of everyone, and more importantly, secure some more of their time and effort in the future should you ever need it. There you go, four simple ideas for trying to get some more creative input into your projects. The last few weeks, maybe even last couple of months have been a crazy fast blur fest. It started with a simple notion, to begin to create bigger and better productions with a small budget. To help me produce narrative films with a budget, I ran a fundraising campaign via crowd funding website Pozible, which helps people raise much needed cash flow for a plethora of creative projects from feature films to filmmaking tools, to music EPs, comedy tours and much more. I wanted to make a couple of posts outlining the story and my experiences so far, from the perspective of both Producer and Writer/Director of this short film, so that those of you who are interested, can maybe get a little bit of insight into what it’s like trying to make independent, very low budget (with high production value) narrative films. When wearing many hats in producing one’s own content, probably the first thing that you must allow for is the amount of time it may take for even one task to be completed. A perfect example is my crowd funding campaign for what began life as ‘My Roommate Is A Serial Killer’. I picked Pozible as our avenue for fundraising, as it is specifically for Australia based creators, and has a few nice tools in helping create a page for the project. My experience with Pozible was very positive. It was simple and easy to set up, and you basically ‘pitch’ the project to Pozible’s team and receive an invitation to start fund raising. I like this idea as it gives me, as Pozible’s customer, a sense of exclusivity. I even received a personalised message from the creator of Pozible and giving me his own take on my intro video and what he has seen work best when raising money. Was the campaign successful? Yes and No. We raised our $600, (btw, this was not the total amount I thought we would need, to make a realistic short film I estimated the budget to be approx $2000), but I felt that if I had planned for more time which as I mentioned above is reduced drastically when you also perform other roles in a production, I would have been able to maintain and gather hype/interest in the story itself. Lesson learned for next time! Once the funding was raised, I took a long break as Producer as I had to switch to Writer to flesh out the story. Another lesson learned…whilst I had the premise and outline of the story, had I of been able to move ahead with a full script in tact, I may have been able to market the fundraising more toward getting other creatives/talent onboard, such as actors. It would have been great to get online auditions, video blogs and the like. Anyhow, once the script was effectively written (it has changed form drastically from it’s original concept, and now called ‘Journey From Madness’), I moved ahead once again to tackle the next logistical issues. Locations. I wanted to secure locations that added production value (read interesting), to avoid something I feel that many short films (especially mine) fall into, and that is poor locations. You can have as dynamic and emotional scene that anyone has ever read, but an audience will get lost in that scene just that little bit extra if a location is chosen well. A piece on someone contemplating suicide is much more dramatic if filmed atop a cliff rather than against a plain bedroom wall. The story was written to be set on a train journey, so naturally I wished to go down a few avenues to see if it was possible to film on one, but I also wanted to play it safe and pursued filming aboard another icon of public transport…the bus. Now, many low budget/gorilla shoots will forgo location permits, as there is just not the funds available, and I have shot many a scene with nay a permit secured. I’ve never hit a barrier personally, but this time I wanted all cast & crew to feel safe and secure, especially on board a potentially busy and crowded train/bus. The less stress we felt on the day, the better the shoot would go. RailCorp were my first port of call, as they operate both train platforms and commuter trains in NSW. The process was actually very straightforward, and I was quickly put in contact with the special events team in RailCorp who were incredible in helping accommodate my needs and exceeded all expectations. My hats off to them. Once the location was secure, I made sure I put in place relevant insurances, booked out our production gear, and we were ready to go! Our locations were simple. We film on board a train from Newcastle to Central, and then back again, and complete filming in Newcastle Train Station under the helpful eye of RailCorp OSM (Safety Manager) Bryn. Thanks again for your help Bryn. All went smoothly…well nearly. A couple of delays in the morning meant we didn’t start filming until approx 1030, and we were forced to alight at Hornsby rather than Central due to overcrowding, but things will always go wrong on the day, it’s how you adapt and problem solve as you go which will determine whether you overcome those barriers. I now am waiting to put my producer hat back on for post-production, as soon as the rough cut is done (by myself). We have some great footage, and I will run through thoughts on the story and experiences in relation to directing on the day when I can soon. For now, I hope you enjoy a few pics I managed to have taken for us. Movember. A way to get my mo in the palm of your hands. Ever wanted to hold a moustache? Well now you can! 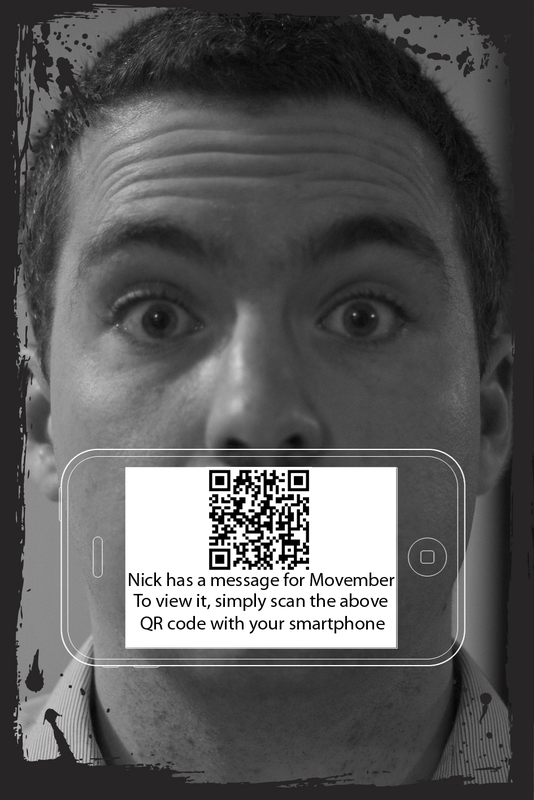 Simply make sure that you have a QR reader on your smartphone (NeoReader is a great free one), and see what I have say about movember! Whilst photographs are not strictly my domain, I do know a very talented photographer by the name of Kylie Daff, and inspired by some incredible imagery of hers, I wanted to create a cinemagraph. What’s a Cinemagraph you say? Well it’s a term coined by Kevin Burg and Jamie Beck over at photography blog From Me To You and uses an old file type to provide animation to a still photograph. To create these two test cinemagraph’s, that very talented photographer that I mentioned above took some video for me to experiment and play with last weekend during a shoot. I really love the idea of displaying a ‘living photograph’. Whilst some may look creepy and Harry Potter-ish with moving eyes, it really goes one step further in capturing emotion and blending two forms of art together. When I get a bit more time I will run through the process I followed. Edit: You may need to click on the picture to see the full effect! Help make my next short film! Hands up if you have ever watched a short film? Not many in the world have in my opinion, but they can be a great for of entertainment on your phone, laptop, ipad etc which won’t demand much bandwith or much of your time. Visit the link above to learn about my new project and whether it is something that you may want to contribute to seeing. Here’s a link for a music vid i provided some camera work on a little while back. The band is called Pat Capocci Combo, the music vid ‘baby sue’, and not a bad vid for a no-budget shoot! Congrats to the creative team. It’s been a little while since my last post. Again. ‘Observe and Report’ had been getting a little dusty on the editing shelf as it were. I have spent the last couple of months at a snail’s pace on my filmmaking life. My 9-5 job (which is actually like 1-10, sometimes 3-midnight, since I’m an out of hours worker) has taken a lot out of me recently, and I have been left with little creativity, or little drive to be creative when I am at home. Being an aspiring filmmaker is always a double edged sword. On the one hand, I would love to have more time in the day/week/month to simply create something that others wish to see. However, to do this, I need more money, which is where the full-time work comes in handy to not just pay bills like everyone else, but to also save and invest my money into my equipment and film funds. If there is more pressure over one edge of that sword, such as stress at work, then the other edge suffers, and sometimes buckles under the weight. Thankfully, I have recently been able to participate in a project at work which sees me being able to get back to normal, and work mainly the 9-5 routine, leaving far more time in the evenings for me to dabble in my art. The top three pics, left to right, show first the raw image from the video captured, the balanced image after the brightness and contrast are set, black point and white point set, and the balancing of shadows, mid-tones and highlights of the image and the third image shows the final ‘look’ of the scene (I’m not great at this, so I’m still learning). The raw image was captured using Canon’s Standard picture profile (that is, neutral contrast, saturation and colour tone settings and additional sharpness in the picture captured). The shot was then balanced and matched with others in the scene, so that the film flows and shots do not look out of place if they have been filmed on separate occasions (which occurred for this particular scene). A look was then created from that matched shot to help with the look, feel and atmosphere of the scene (I chose warmer here, in relation to Megan having a chance to find her handbag). The other three shots show a raw shot, matched shot (look for similarities in the matched shot above it), and the original ‘look’ I picked for entry into the Melbourne International Film Festival. That look was difficult to carry across the other shots simply because that they were not previously matched. Lesson learned! Whilst the sound mix was being done, I took the time to match all the shots and apply the final colour grade. Now all is complete, and I am just waiting on the sound mix to be delivered. Once that’s done, it’s off to some small film festivals, and more importantly online where I hope to have many many people watch and enjoy. So as I wait for the outcome of my entry into the Melbourne International Film Festival, I thought it’d be hopefully uself to anyone out there interested in picking up a camera and making a narrative film, to step you through the equipment/tools I use to attempt to make anything I complete of ‘acceptable’ production value quality. But first, it all begins with a script…. The current scriptwriting software I use is Final Draft, a very well-known screenwriting program that formats your script into the Amercan industry standard format. It’s very useful to have a script looking professional, as whilst you may be the only one to read it, it actually helps you asertain the running time of a film. 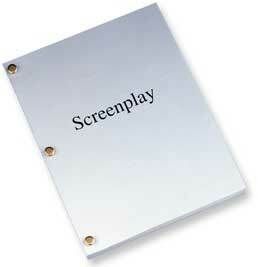 As a rough guide (and this is rough), one page of script equals one minute of screentime. Once you know how many pages your script is/how long it will run for, you can begin to ask yourself questions like, ‘why, in a 7 minute short film, do I introduce the main character on page 6? Once your script is complete, you can begin to plan for the shots you would aim to show. 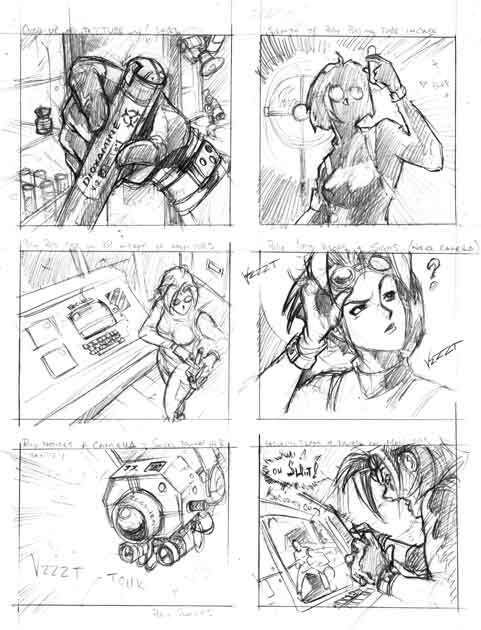 We all have movies in our heads (unless that’s abnormal and I should speak to a professional), but when you are on location, speaking to your director of photography, the best way to show those shots (and also know how long those shots would take to set up) is to storyboard your project. For storyboarding, I actually kill two birds with one stone. The Cinemek Storyboard Composer is a nifty application for iOS mobile devices (such as the iPhone). You take pictures of a location you intend to use, then insert track marks, dollys, pans, and actor blocking movements into the photo, making obsolete my incredibly stickmen-like storyboards of the past. It is incredibly useful, and was how I storyboarded Observe And Report. Other than a pen and paper, these were the only tools I utilised before I went to film. There are a variety of pre-production tools/software out there, and I would say that I would have probably benefited from the sue of others, but to me, this is the bare minimum you need to get a low budget project to shooting stage. Of course, once you have a script and shot list sorted, you can then plan on the number of actors required. Which scenes they will be needed, how many locations you need, the equipmtent needed to setup and film a dollying jib shot, the time it will take to setup and film the same shot, pretty much all logistical planning comes from a combination of the script and storyboard. What pre-production process do you use when planning your own projects? I’d love to hear from other aspiring filmmakers if you would like to post your thoughts/comments below. Next time, I’ll go through my equipment choices with observe and report, as well as how I picked and chose my actors for the film. I want to make make awesome films, come & join in!